Our Saviour’s supports a number of community groups by offering them use of our space for meetings and other activities. One such group, Project from the Heart, gathers on Thursday mornings to assemble care packages sent to our armed forces in Iraq and Afghanistan. This local nonprofit organization has shipped more than 7,000 care packages to members of the military since 2002. The church also hosts special community music programs, including a benefit concert in which local high school musicians performed to raise money for Habitat for Humanity. 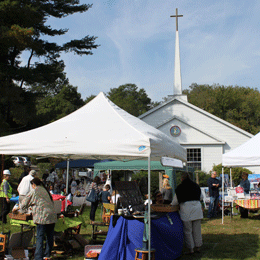 Our Saviour’s also holds the annual Hill Farm Fall Festival in early October. This outdoor community event attracts dozens of vendors who sell arts and crafts, jewelry, clothing, food and other merchandise. Pony rides and a petting zoo are available for children. Proceeds go to support Operation Hope or one of our other mission partners. Among other groups that use the church for meetings is Alcoholics Anonymous. AA holds a regular meeting at Our Saviour's every Friday night at 7:30 pm. If your group is interested in using our space, please contact us for further information.